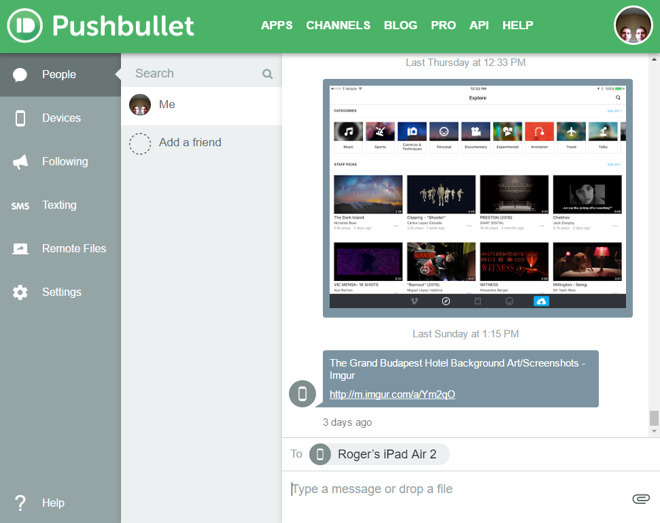 At its core Pushbullet operates much like a messaging app. Once you've found a file or link to share, you can go to a chat-style interface (or use the iOS app extension) to send the content, whether to yourself or one of your friends. A key difference, though, is that when sending material to yourself, you can choose to push it to a specific device, or all of them simultaneously. Another important point is that in addition to iOS, there are also apps for Android, Windows, and the Web, plus extensions for Chrome, Firefox, and Opera. Users can for instance push a Web link from their iPad to their Android phone, or have an iPhone screenshot automatically pop up in a new Chrome tab. With every device hooked in, Pushbullet becomes an extremely convenient way to shuttle content around without having to use email. It also offers features like remote file access, end-to-end encryption, and a small selection of "Channels" users can follow for things like new xkcd comics. The iOS app is comparatively limited —users can only send links, images, and basic text, whereas Android phones can send messages over networks like SMS or WhatsApp, and even have their notifications mirrored on the desktop. Some functions are gated behind a Pushbullet Pro plan, which costs $4.99 per month or $39.99 per year —this includes perks like being able to send files over 25 megabytes, and getting 100 gigabytes of storage space instead of the default 2. 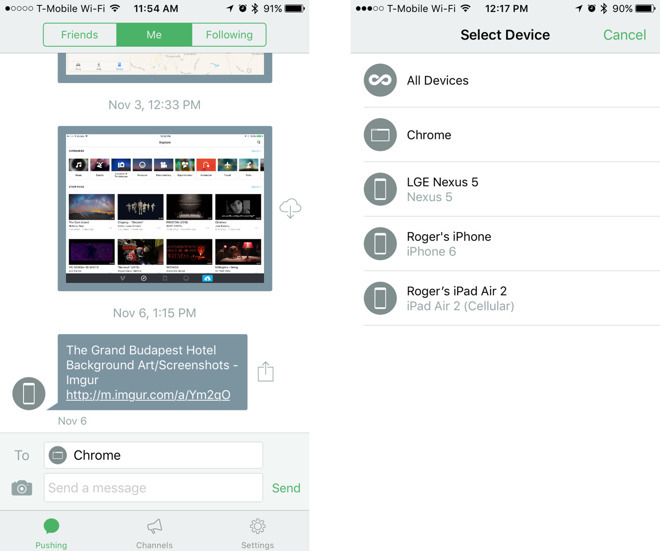 Otherwise Pushbullet is a completely free platform. The iOS app is 24.8 megabytes, and runs on any device with iOS 9 or later.